From the Archives: June 2013 – Jenny and Jonathan Got Married! In June 2013 a robin started a nest on the ledge above our front door. That evening the breeze came, and the nest fell apart. In the morning, Sisyphus re-built the nest. The evening wind blew it away again. This happened for several days. Each night the wind destroyed a partially-finished nest. Then one night we had a hard rain. The next morning, this robin started back up with the nest-building. This time with muddy grass. The nest stayed together this time. We set up a camera on a tripod so we could see into the nest. One day two eggs appeared in the nest. Then one day the eggs turned into beaks and fuzz. 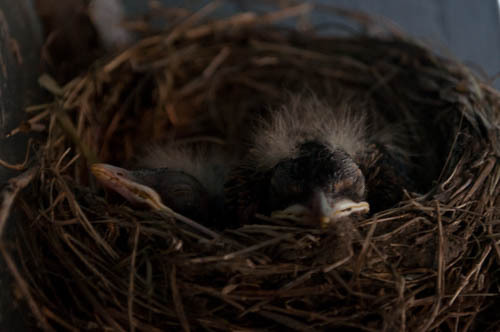 When we sat on our porch, we saw little beaks poke up from the nest. We watched them reach out at feeding time. We watched the beaks get bigger and bigger. We watched the chicks fledge. I was on the porch the day that one of these chicks hopped out of the nest. Both of the robin parents were away at that moment. The chick took off into the bushes. Then it was gone. Then one of the robin parents returned to the nest. It looked for the missing chick. I wished that I could speak to the robin parent. Tell him or her that this chick just took off on its own. But of course the robin parent already knew this.